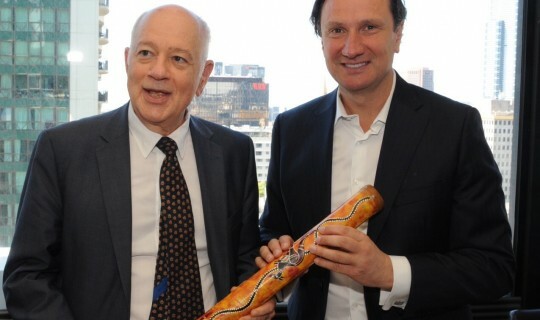 The Greek Community of Melbourne and chief executives of Australia's large investment funds welcome the announcement by the Economy and Development Minister of Greece, Dimitris Papadimitriou, that Enterprise Greece will open a Melbourne ofice - its firsts outside Greece - to pursue investments from Australia. Mr Papadimitriou visited last month Australia and the Greek Centre where he met with a group of Greek-Australian managers of large investment funds. Bill Papastergiadis President of the Greek Community welcomed the announcement: "We are pleased with this announcement. This demonstrates a resolve by the current Greek government to action matters quickly." "As has been reported, we invited the Minister to the Greek Community Building only one month ago and had him meet the key funds and superannuation managers of Australia of Greek background. The meeting was informative from everyone's perspective. From the Australian contingent we explained the current framework for funds raising for major infrastructure projects and the relationships of banks and private equity.The Minister provided a detailed assessment of Greece's position on current projects, taxation incentives and future prospects. At the conclusion of the meeting, we proposed that it was important that the Greek Government set up an office of Enterprise Greece in the building owned by the Greek Community of Melbourne. We made it clear that we would offer the space free of charge." Greek-Australian managers of investment fundsÂÂÂ welcomed the announcement. Peter Siapikoudis, Principal Consultant and Head of Infrastructure of the Frontier Advisors said: "Melbourne represents a significant Greek diaspora but also a large number of institutional investors who have a growing appetite for infrastructure investment. The opening of an Enterprise Greece representative office in Melbourne will provide a key link for Greek infrastructure investment opportunities." Dr George Nassios, Strategist at Escala Partners noted: "An enterprise Greece office in Melbourne will mean that potential Australian Investors in infrastructure and other investment opportunities would be able to start the discovery dialogue at an earlier stage that could lead to successful engagement."